Quality custom cabinets are the most expensive type of cabinetry. There is practically no limitation on colors, finishes or texture or options; any suitable material can be used. They offer are very high quality which is reflected in the pricing. However, if a cabinet is labeled “custom” but has a low price, then the materials, finish and workmanship will almost certainly be of a lower quality. Custom cabinets offer customizable sizes as well as the widest range of configurations, finishes, functionalities and options. There is typically an 8-12 week lead time to delivery. 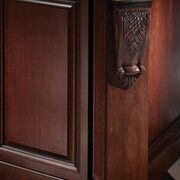 We’re proud to offer Rosewood Custom Cabinetry. Semi-custom cabinets are more affordable than custom but still give you a lot of choices. 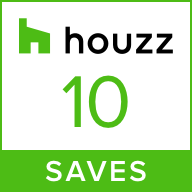 They offer a wide range of finishes and door styles than stock. Quality is similar from brand to brand. Allows limited size customization as well as many different configurations, finishes functionalities and options. 4-6 week lead time to delivery. We offer Merillat Masterpiece Semi-Custom cabinetry. Stock cabinets offer good value and are the most affordable. There is a moderate selection of styles, finishes and accessories. Quality is good and most have some kind of warranty. There is a limited number of size, construction, accessories and material options. Sizes and configurations are limited is available but many alternately-sourced accessories can be used. 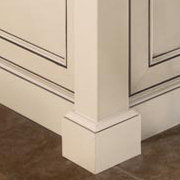 This makes stock cabinetry widely used in both modest and expensive homes. 2 week lead time to delivery. 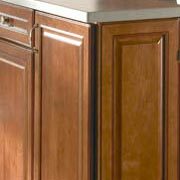 We offer Merillat Classic and Merillat Basic stock cabinetry.